Yes it is Tug. He is also featured on some other Malta photos. Yes definately Lennie Ross,also other names I can remember :- Pete Harfleet, Trevor Howes, Taff Lewis and ? Stephenson. There is someone there that looks like Gaff but I thought he was in 6 Platoon. There must be someone out there who knows who everyone is. Yes defiantly Stephenson far right on the front rank. Come on Gaff you should be able to name most of these guys on this picky. I'm still trying to trace an old mate of mine Paddy (Malachy) O'Neill, his family haven't heard from him for over thirty years. He went from us to RAF Regiment. OK, Her are a few people I recognise. John O'Connel, Brian Standring, Kenny Hewitt, George Kaja, Mick Knox, Jimmy Wall, Geoff Tucker, Ron ?, Thommo, Dave Fenwick, Jim Coffee, Taff Lewis, John Holder, Pete Harfleet, Chick Hulston, Lennie Ross, Stevo, Tony Bradley is also in the rear rank. If I could zoom in without losing the quality I could Probably name a few more. Just noticed, middle rank standing between Jimmy Wall & Geoff tucker is Benny Benfield and standing next to Him Is The Guy called ron whos surname escapes me at the moment. some of you may remember just before we went to Malta he started using a double barrelled name grerw a handlebar 'tache and started to wear Tweed clothes wear a cravat & smoke a pipe ... hold on I think he may be called Ron Morris. Gaff is that Trevor Howes to the right of Lennie Ross and did he go PTI? Trev had already been a PTI in Maida. I nicknamed him the "The Beast of Maida" and it stuck. LOL. Him,Dougie Kemp and Taff Payne used to make the Crows fly.In fact he had only just got back to B Coy when that photo was took. Like the new handle diffy gaba. Do you know what happened to Howes, was he promoted? Pat Peters says he was a mate of his and has been trying to look him up. I came through depot with him (273 Pl), bit of a dodgy character !!!! (that ought to wake him up). Will you be going to colly? 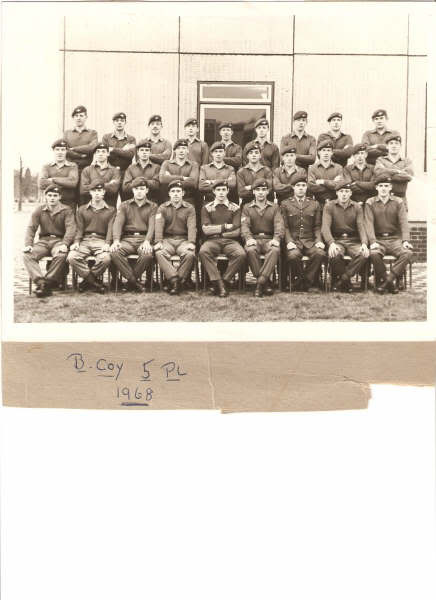 Is this Gaff from 308 Plt, in the holiday camp Maida Barracks, OC Knoddy Bridgeman, Plt Sgt Bill Millington and Corporals Bernie Mullan, Mick Swain and Mick Derling? I think we fought each other in the Battalion Championships in Malta.